I love cookbooks, and I’m of the opinion that you can never have too many. 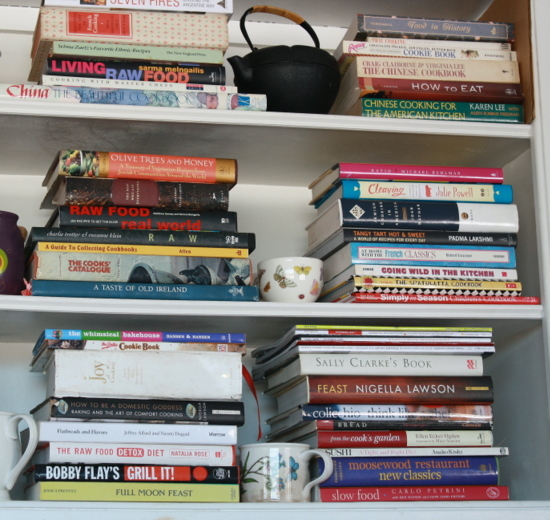 …but when Kalyn posted this list, I realized that I only had one or two books written by food bloggers. 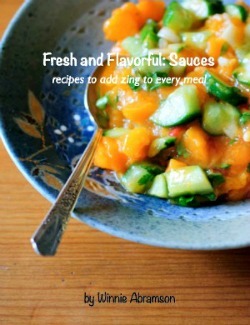 Since I’m a food blogger (obviously) and a “wannabe” cookbook author (hey, I can dream, can’t I? ), I wanted to show some love to those who’ve made the jump from blog to book as well as to some of the cookbook authors who didn’t necessarily start out as bloggers, but who also happen to have great blogs. The Pioneer Woman Cooks: Recipes from an Accidental Country Girl by Ree Drummond. A Homemade Life: Stories and Recipes from My Kitchen Table by Molly Wizenberg. The Breakaway Cook: Recipes That Break Away from the Ordinary by Eric Gower. 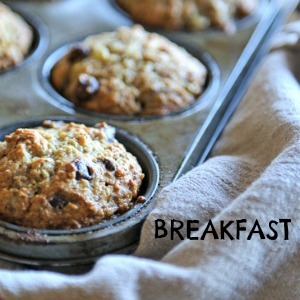 Gluten-Free Girl: How I Found the Food That Loves Me Back…And How You Can Too by Shauna Ahern. Artisan Bread in Five Minutes a Day: The Discovery That Revolutionizes Home Baking by Jeff Hertzberg, MD and Zoe Francois. 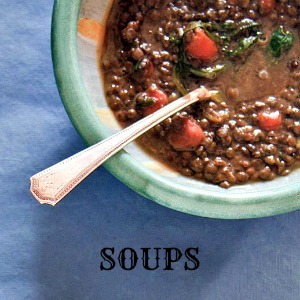 Vegan Yum Yum: Decadent (But Doable) Animal-Free Recipes for Entertaining and Everyday by Lauren Ulm. The Steamy Kitchen Cookbook: 101 Asian Recipes Simple Enough for Tonight’s Dinner by Jaden Hair. Modern Spice: Inspired Indian Flavors for the Contemporary Kitchen by Monica Bhide. Baking: From My Home to Yours by Dorie Greenspan. 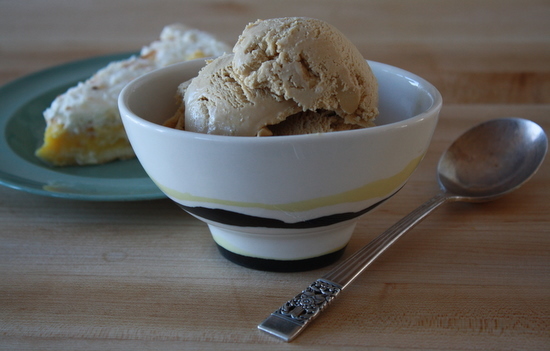 Perfect Scoop: Ice Creams, Sorbets, Granitas, and Sweet Accompaniments by David Lebovitz. Please know that if you are a blogger and I didn’t get your book this time around, it’s not because I didn’t want to! I would be thrilled to own every food blogger cookbook in existence. Please also note that I have previously featured two healthy cookbooks by bloggers on Healthy Green Kitchen: Sweet Freedom: Desserts You’ll Love without Wheat, Eggs, Dairy or Refined Sugar by Ricki Heller of Diet, Dessert, and Dogs and The Gluten-Free Almond Flour Cookbook by Elana Amsterdam of Elana’s Pantry. 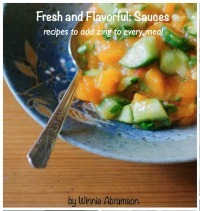 I love both these books and cooked from and blogged about them extensively during past healthy cookbook giveaways. And I had my new books less than 48 hours later…aren’t they pretty? I didn’t buy them just for looks, though. I wanted to cook from them, each and every one. So over the course of a day when I had a couple of family gatherings going on (the last day of Hannukah and my dad’s birthday being the main celebratory occasions), I worked a recipe from each book into the festivities. Wondering what I made and what I thought of each recipe/book? Well, here’s the round-up! Like the rest of the blogging world, I heart Ree Drummond. If you don’t who Ree is, allow me enlighten you. Ree is the force behind the incredibly popular blog, The Pioneer Woman; she is also the homeschooling mom to 4 adorable kids. I’ve no idea how she does it all. I guess I had my head under a rock or something these last few years because I am relatively new to her site. Ree’s cooking style is very different from mine, but I was still just as charmed by the book as I am by her blog. Like her blog, the book is not just about cooking; it’s full of gorgeous photos of her surroundings and the people and animals in her life, too. 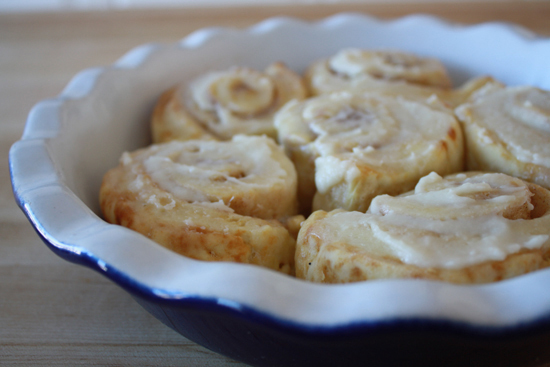 Because they are sort of legendary, I made her cinnamon rolls. 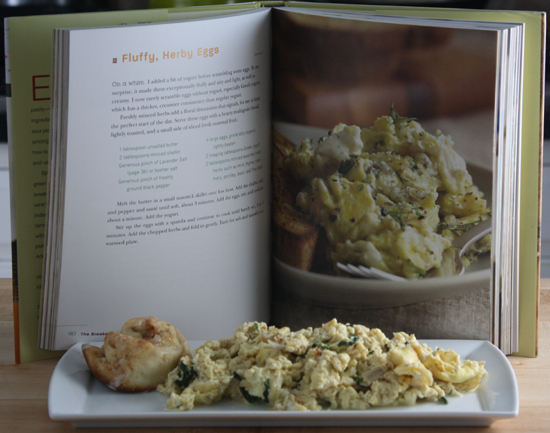 I have never used a recipe to make scrambled eggs before, but this egg dish from Eric Gower’s book really called to me. They feature Greek yogurt, a generous amount of herbs (I used basil), and one of his signature flavored finishing salts (this one was lavender). The result was superb. I love chocolate as much as the next person (ok, maybe a little more than the next person), but I have never been so bold as to put chocolate in a salad. After tasting this though, I will definitely be doing it again. I had no pistachios, so used toasted almonds instead. I thought this salad was truly fantastic. I also think that the book on the whole is fantastic. 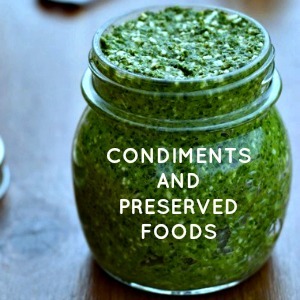 I love Molly’s writing and the way she intertwines the recipes with stories from her life. 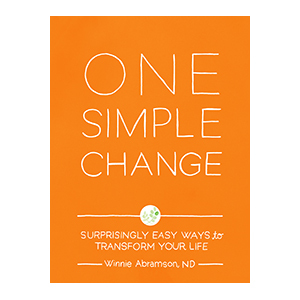 Just like her blog Orangette, this is a memoir that is incredibly charming. I enjoyed every page. As someone who’s made yeast bread every now and then for over 20 years, I was really interested in this book because the “5 minutes a day” promise just seemed so far-fetched. The authors blog at Artisan Bread in Five and once I sat down with the book and understood the premise of the master recipe, I was really eager to try it out. The master recipe was just as simple as the authors’ said it would be, and it really truly doesn’t require any kneading! Pretty amazing. I used the dough to make a fabulous pizza that pleased the whole family. I’ll surely be making bread a lot more from now on. Lauren blogs at Vegan Yum Yum. Though I am not vegan, I appreciate her beautiful photography and her recipes always look scrumptious. Plus, she’s just adorable. 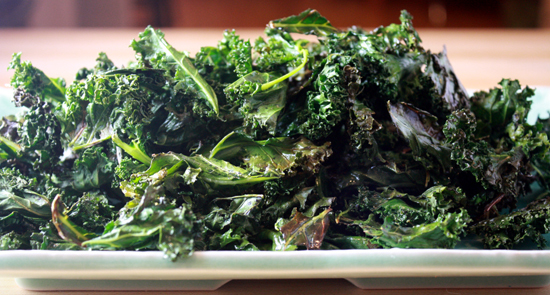 As far as this recipe goes, Lauren states in the book that this is a “wonderfully fun, crispy side dish”. She is absolutely right. 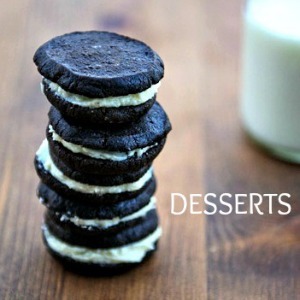 This is so quick to make and it is truly addictive to eat. Lauren took all the photos in the book. They are really really lovely and I am really really impressed. I think Lauren’s got some truy unique recipes in here, and I’m so happy to have added this one to my collection. Like A Homemade Life, Gluten-Free Girl is only part cookbook. It’s a memoir, too, and I enjoyed it immensely. I love Shauna’s passion for food, and this passion is evident in every one of her blog posts (located at Gluten Free Girl and the Chef) as well as in this book. I decided on this recipe because Shauna says it’s the recipe that changed her mind about cauliflower. I like cauliflower ok, but I’ve never before considered it delicious. This recipe, though, really is delicious. Really. I am a relative newcomer to Monica and her blog A Life of Spice, but it doesn’t feel that way. I took a writing tele-class with Monica a month or so ago and have since corresponded with her by email/facebook/twitter a bunch of times. She is such a sweetheart and such a wonderful food writer, too. I made what she calls her signature dish and just adored it. I didn’t have catfish so I used wild mahi mahi instead- I’m a total sucker for anything with coconut milk and this really was fabulous. I can’t wait to delve further into this book. Jaden from Steamy Kitchen, is a sweetheart of a person who I also know through email/facebook/twitter. I have a special place in my heart for Asian food (I lived in Japan for a short time when I was younger), and I just love her “modern Asian” approach. Jaden did all the food photography in her book which just simply amazes me. There are so many drool-worthy pictures in here, which made it all the more difficult to decide what to make. Since I was able to find fresh wild squid at my local fish market (and they even cut it into those neat little rings for me!) 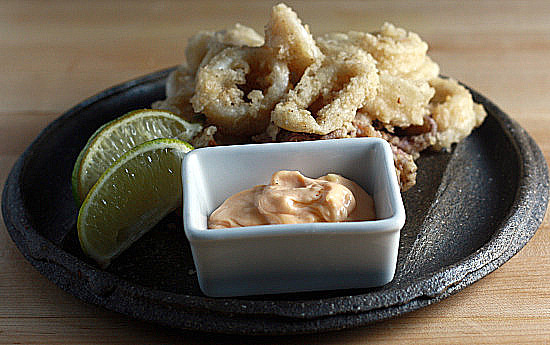 and since I’ve never made fried squid at home, I gave this recipe a try. It was quite easy to do and the results were delicious! I’ve seen Dorie Greenspan’s delectable-looking recipes in magazines and all over the blogosphere, so when I decided I needed a baking book, I did not hesitate in choosing this one. It is a large and beautiful book that I’m so pleased to now own. 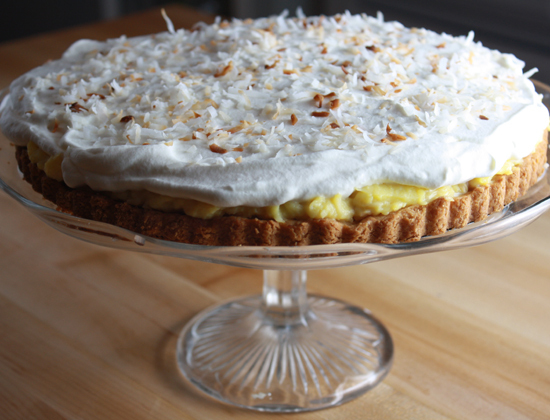 We were celebrating my dad’s birthday and I wanted something rather “show-stopping”, so I went with Dorie’s coconut custard tart. It was every bit as yummy as it looks! This book was already in my collection, but I adore it so much that I wanted to cook from/feature it again. I love David’s writing and his recipes; I’ve previously made his vanilla, chocolate, mint chocolate chip, and salted caramel (the last from his website, not the book), and they have each been spectacular. Because Dorie Greenspan suggests serving the coconut custard tart with espresso, I made David’s coffee frozen yogurt (not that there was too much point in lightening things up, giving how much food had already been consumed to write this post!). It was a wonderful choice with the tart, and the perfect end to a perfect day of food! 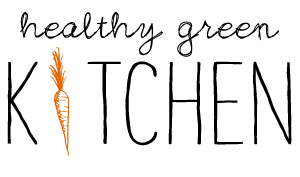 Many thanks to Foodbuzz for accepting my proposal and allowing me to be part of the December Foodbuzz 24,24,24 event. 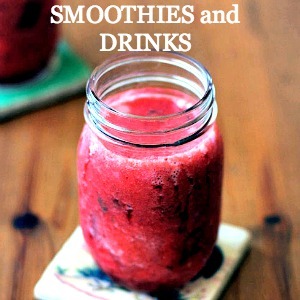 I had lots of fun putting this post together, and I just love my new cookbooks! Such a wonderful round-up of all the blogger cookbooks! 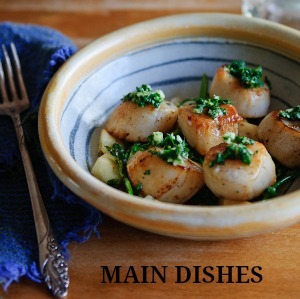 Very nice post and now I officially envy your cookbook collection :) Great recipes btw. PJ- thank you for your sweet comments, as always! Ricki- I really can’t pick a favorite; I enjoyed them all! 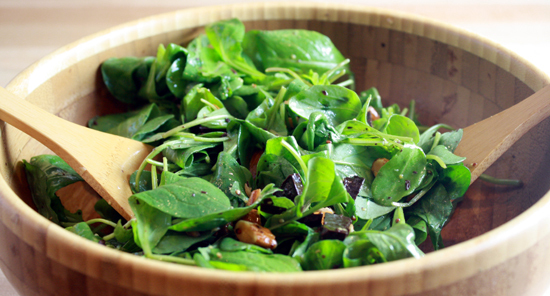 You should try the chocolate salad though…with vegan dark chocolate…really really good! Hope you saw that I mentioned your blog/book at the beginning of the post…I love Sweet Freedom! Wow hun! These all look amazing – I might be super jealous right now ;D. Great collection you’ve got there! 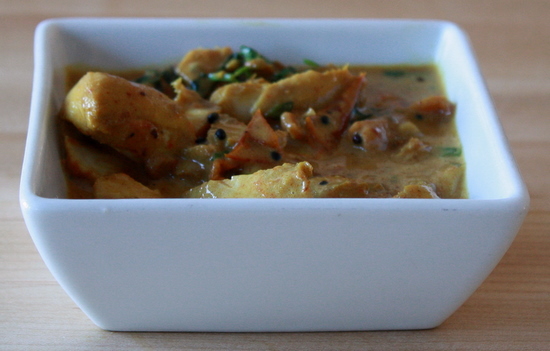 Thank you for trying out the Master recipe from ABin5. Your pizza is gorgeous! You’ve inspired me to get out all my books and create a menu from my favorites! So glad you came by! I look forward to exploring your baking blog, as well! An interesting concept for 24, 24, 24 — and a great introduction of some of the blogging super stars for readers. Your 24,24,24 post looks so interesting, as well…I’ll make sure to read it through when I have more time tomorrow. So honored to be on the list! Thank you Dr. Winnie. In great company, too! So nice to “meet” you! I really really love your book…thanks so much for coming by! Wow! I’m impressed that you cooked so many great sounding things from the bloggers cookbooks in such a short time. Fun post! It was a little bit busy but honestly most of these recipes did not take too long. Was fun! 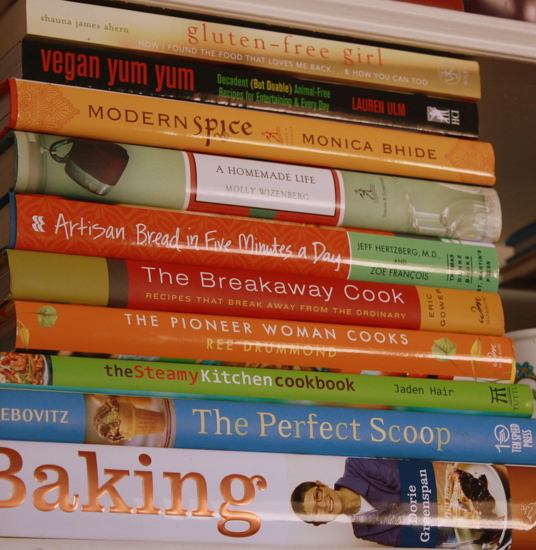 love the pix of your cookbook collection. I too believe you can’t have too many cookbooks:) Wow you had a delicious marathon! All of the chosen recipes sound great. Im putting the books on my wishlist. 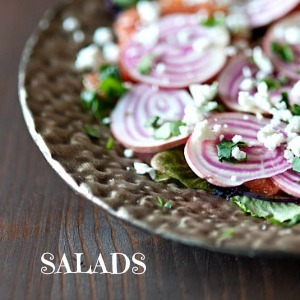 A great post and some very lovely photos of delicious food. A brilliant idea! Hah! What an absolutely fantastic idea for the 24,24,24! What an incredible round up and cooking undertaking. Great idea. Very impressive. 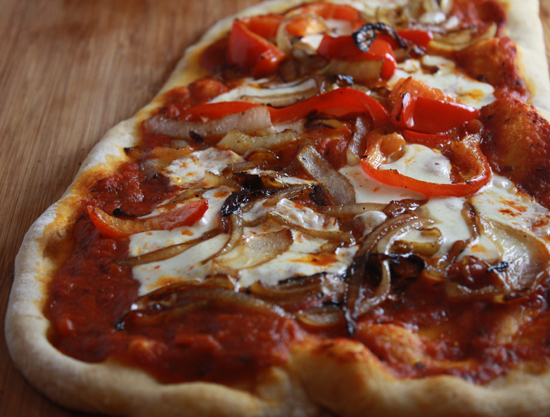 This post offers persuasive proof to anyone that’s ever wondered if we food bloggers can cook! Congrats on your 24×24 post. I love your premise and I love the way you carried it out–perfect! I love, too, your wonderful title! Congratulations! winnie, such a beautiful collection of books. i love karen lee’s book as well as olives trees and honey. and the food blogger cooks- dorie is such a genius. love all the photos. ps my sriracha bottle just finished last night (i am leaving for vacation in a few hours), so when i come back in January i will be scrambling around, looking for one! Lynne, Sam, and Brooke- Thank you so much! Shayma- Have a wonderful trip! MPIH- Sounds like a plan to me, and thanks so much! 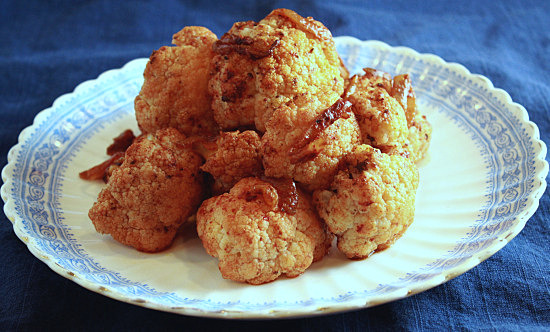 Wow, that cauliflower has me drooling. That, and the coffee frozen yogurt.